Yellows v Reds – It’s a Nose-off ! 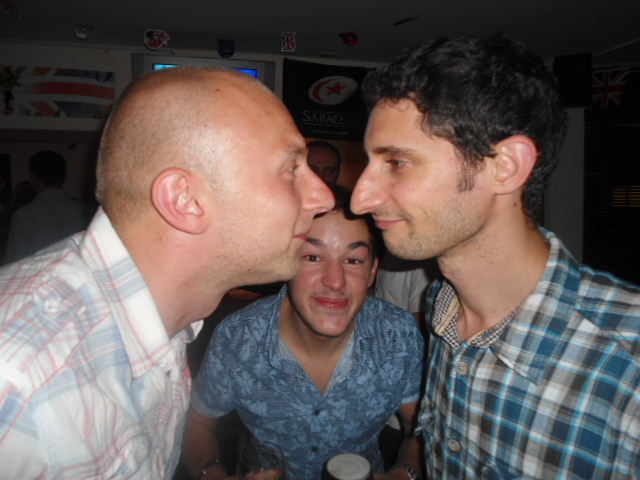 It’s the moment WIFC has been waiting for.. the long awaited nose-off between Rich Wenham and Dave Soloway will be taking place this Saturday at the Met Police, as the two long-serving club stalwarts go nose-to-nose and manage the Yellows and Reds in the annual game. 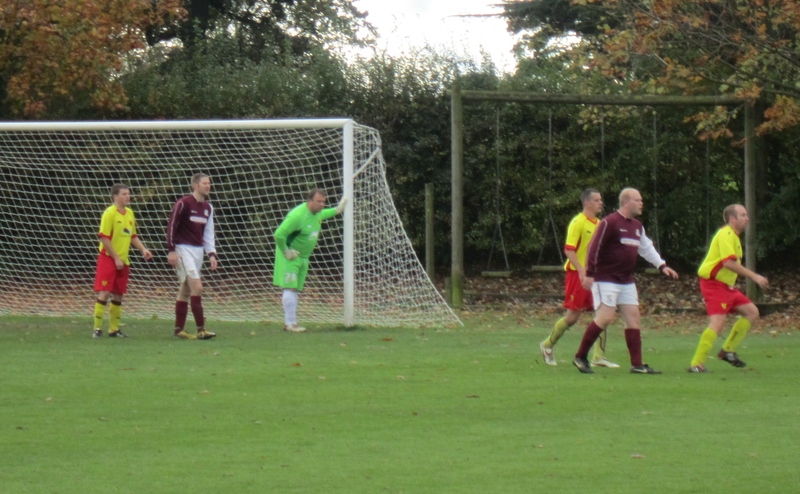 Last year, Phil McBride led his Red Squirrels to a 4-3 victory against Matt Wells’ Yellow Badgers, so Soloway will be hoping to emulate that success as he takes on the reds, while Wenham will manage the yellows. The squads for this momentous challenge are below, and it’s good to see some old names coming out of retirement to join the fun, not least club record appearance maker Julian Carrera and exiled Swede Jerker Kjellander is also over for the game. Jez Hinds, Ed Sterry, Richard Messenger, Alan McTavish, Paul Labbett, Mat Ball, Jamie Parkins, Andy Lewers, James Jenkins, Rob Stone, Paul Whittenbury, Dave Soloway, Alex Prentice, Dave Messenger. If any further players are available, please let Chris Davis know and he’ll add them to the squads. 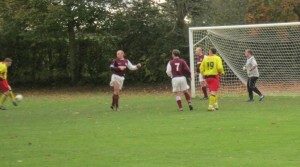 WIFC recorded a 4-1 win against Northampton at the weekend, to make it five wins in a row since the middle of September. The run is the best the club has had since early 2008, and has propelled WIFC back into the top ten in the IFA league for the first time since 2009. 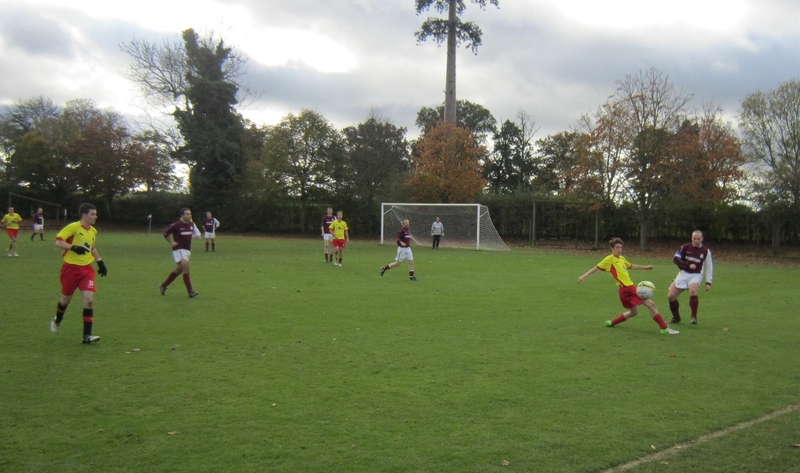 WIFC were made to work hard for the win by a decent, hard-working Cobblers side, who embodied the spirit in which IFA games are played. After a patchy start to the game, both sides started to knock the ball about and it was the home side who struck first when Dave Soloway chased a lost cause on the goal-line. While his pull back intended for Ben Clarke was blocked, the ball fell nicely for the recently married Soloway, who finished smartly for his first goal of the season. Richard Murphy prepares to challenge for a high ball, watched by James Jenkins. Just as last week at Chorley, the goal put a spring in the step of the Internet ‘Orns, who went on to dominate the rest of the first half. 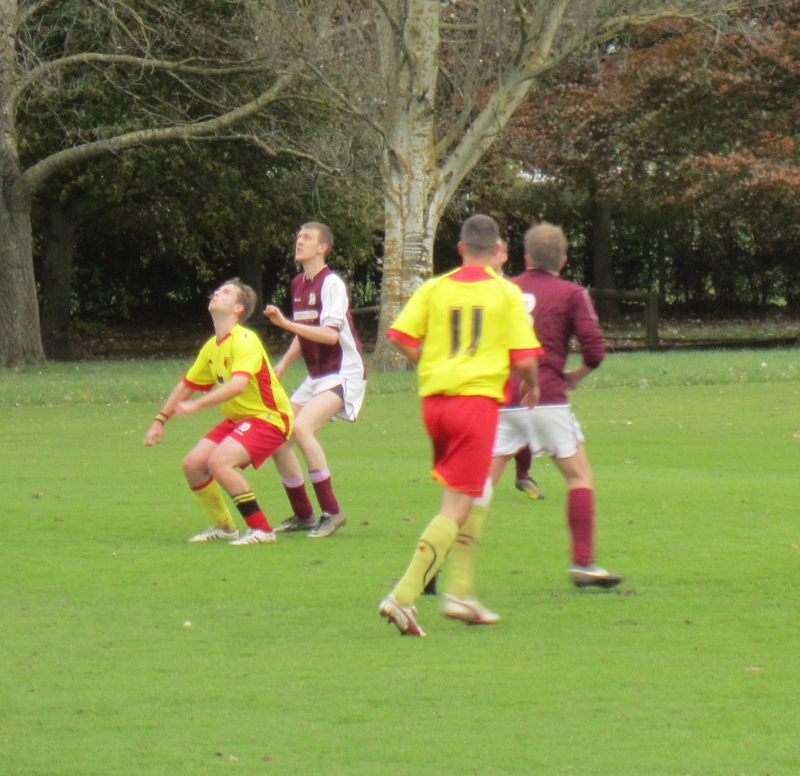 The lead was doubled when Andy Lewers sprinted clear of the visiting full-back and his firmly struck, low cross was diverted in for an own goal. 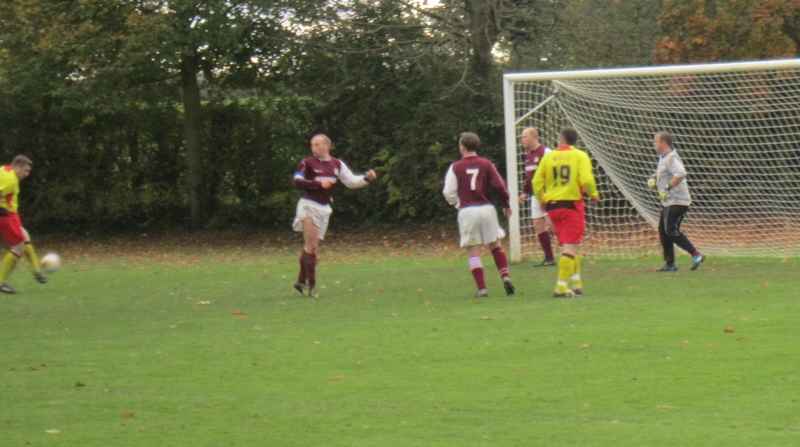 It was soon three as skipper Joel Moody, revelling in space on the left flank having started the game up front, picked up the ball, cut in and smashed his second of the season from the edge of the box. 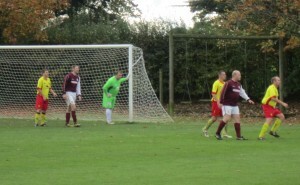 The second half saw the visitors re-group and work hard to stifle the home side. Lewers, Moody and Richard Murphy sent in a number of decent crosses, and man of the match Brad Simmons overlapped well, but the visitors held firm until the 60th minute, when Alex Prentice controlled the ball and finished neatly to become the 18th different goalscorer for WIFC this season. With further chances falling to Prentice and Matt Ainsley, WIFC could have extended their lead further, but it was the visitors who completed the scoring when their exuberant full-back got forward, grabbed a deserved consolation and earned a yellow card for a somewhat excitable celebration involving his shirt and the corner flag. Team. 4-4-2, R to L. Richard Walker; Brad Simmons, Stu Nicholls, Maurice Clarke, Matt Wells; Richard Murphy, James Jenkins, Dave Soloway, Matt Ainsley; Joel Moody, Ben Clarke. Subs Andy Lewers, Phil McBride, Dan Willis, Alex Prentice.